You don’t have a will nor an estate plan? Well now there’s NO excuse — not after you read this tidbit on what some people are doing for their ever beloved companions. And those companions are not bipeds either. They’re of the four-legged kind that would prefer their meals on the floor despite what their caregivers will tell you. 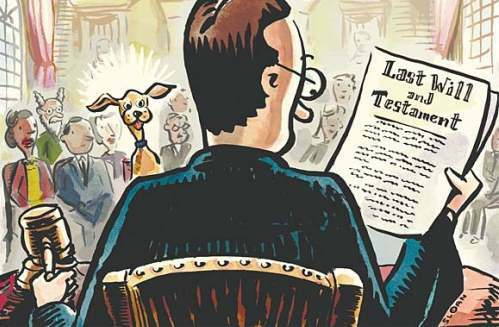 The story: there are people who are making preparations for their pets as part of their estate planning. Most pet owners don’t have the means to match Helmsley’s largesse, but they do worry about what will happen to their pets after their death. That’s why they include their pets in their estate plans. So for those of us who’ve been dragging our feet on this matter, can we now give this a closer look? If some people can prepare their pets for the inevitable, we all can at least be just as prepared for our own families. But I shall confess that there are still several members of my family who, though within an age range that I’d certainly call “ripe”, are still hesitant about putting together a plan beyond a simple will. Why is this the case, I’ve pondered. Why aren’t people more adequately prepared? I’ve eventually figured out that it was to do with people not wanting to face that unpleasant reality called mortality. But just as it’s human nature not to want to dwell on tough subjects like our limited time in this world, the alternative is even more unpleasant: no one likes to think about what would happen to their children if both parents or caretakers should pass away before the children are adults. “Ignorance is bliss: One in ten (10 percent) American adults who do not have any elements of an estate plan say it’s because they don’t want to think about dying or becoming incapacitated. “Where to begin? : Similarly, nearly one in ten (9 percent) adults say they don’t have an estate plan in place because they don’t know who to talk to about creating such documents. This percentage nearly doubled from 2004 (5 percent). Source: 2007 Estate Planning Survey. Perhaps it’s time we set aside our reasons for being unable to get around to doing our estate plan — whether it’s because we’re procrastinating, or because we’re too busy with “life” that we don’t want to think about “death”, or because it’s just a lower priority for us at this time. As parents and caretakers, we’re responsible for preparing for our family’s future, whatever it entails. If pet owners can do it for their tail-wagging dependents, I don’t see why the rest of us can’t follow suit. Now that we’ve established that we all need an estate plan, you may wonder how to go about it. On the outset, it’s a subject that may appear to be confusing, therefore sending many of us to solicit the help of experts in this field. I’ve gotten quotes for such services before and they’re not at all cheap by any means. The cost can be in the thousands, depending on what type of paperwork you are looking to draft. As an alternative, you can do some online research or check out Nolo.com for some decent coverage on the subject. Or you can also pick up a book that explains estate planning in a straightforward fashion. It’s much more affordable this way. The answers to these questions, (and many more) are all explained by Silver in an easy-to-read book. It’s written without technical or industry jargon, and provides the details needed to make sense of Wills and Trusts. This book will help you make sense out of what you may feel is a complicated subject. The six page glossary in the back of the book is probably worth the cover price of the book alone, with some of the more complicated terms described in easy-to-understand language. 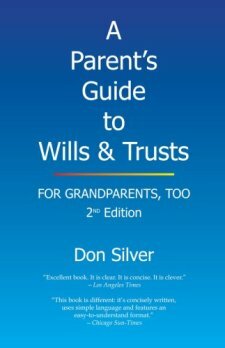 Though there are a number of books on the market to help you prepare your will or create a living trust, I’ve found that many aren’t written in such a clear and simple manner. I’m interested in a copy. My wife and I have been looking into these subjects recently since we have a toddler and another on the way. Not only that but both my parents want me to manage their will/estates when they pass. My parents know zilch about estate planning and I feel like this is a great way to get them (and me) informed about the process. Thank you for the post and the giveaway! I would love to have a copy of this book. Being a grandparent of children whose parents are divorced, I also have a mother who is up in years I need all the help I can get. For my grandchildren I need to set up a trust to protect my grandchildrens inheritance. This would have come in handy 3 years ago before my mom passed away. She always said she had a will but come to find out it was my dads old will that said if she passed away before him my brother and I would split the estate. At this time I have a will that was my dads that I retyped with my name and families names added but my brother says it is not legal. My pop checked out a similar book from the library and wrote one up himself. I don’t think its too complicated to do. I would be interested in this book. I do not have a Will, but have been meaning to get one. I don’t have the slightest idea on how to get started. Thanks for all your interest! I’m running this giveaway for a few more days, then I’ll contact one of you as the random recipient of the book! Thank you for the great turnout so far — I’ll probably do another giveaway later on if I see that this is a topic a lot of people are interested in learning more about. I’d love a copy of this book. I have a relative with a disabled child, and she has been asking for advice on estate planning. We have been procrastinating for too long – perhaps this book will incite some action. Giveaway is closed at this point, but you can still comment! I have chosen ONE “winner” for the book giveaway, which I’m announcing very shortly. I wish I had more copies of this book to give away but unfortunately at this time, I only have one. If you’ve got more thoughts on wills, trusts and estate planning, please don’t hesitate to add them here. Thank you! This is a good post. I never really thought about who I should leave the pets too let alone more important things! Thanks for reminding me! Definitely an important necessity. Thanks for the info. Such good points. We didn’t realise just how many things there were to consider especially having 2 children. Glad we took professional guidance and covered all the bases. I do need a copy of the book as I’m a mom and grandma as well and I don’t have access to a reliable professional service of a lawyer and the like. I would like to update my present estate and allocate them properly to my children and their children, my grandchildren as there’s no assurance what’s going to happen to me sooner or later. Thanks in advance.